What has no backbone, is large enough to be seen with the naked eye, and is an important indicator of clean water? Why, it’s a benthic macroinvertebrate, of course! 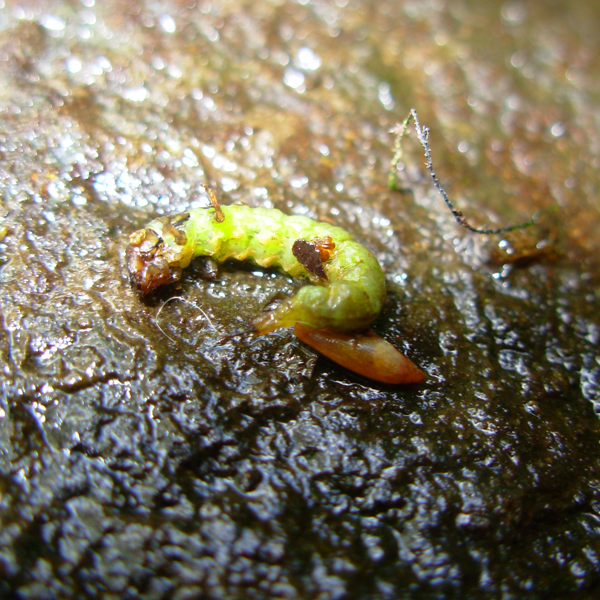 A caddisfly in its larval stage. These tiny creatures live among stones, logs and plants on the bottom of streams, rivers and lakes. They are an integral part of a stream’s ecosystem, occupying the level of the food web between plants and top predators like fish. But don’t think of them as a monolith – they take on a wide variety of roles. Snails and many mayfly larvae are grazers, meaning they feed on the algae that grow on rocks and wooden debris. Most stonefly larvae are shredders – they grind up leaf pack material and other coarse organic particles. Many midge larvae and scuds feed by collecting fine organic particles from the stream bottom. 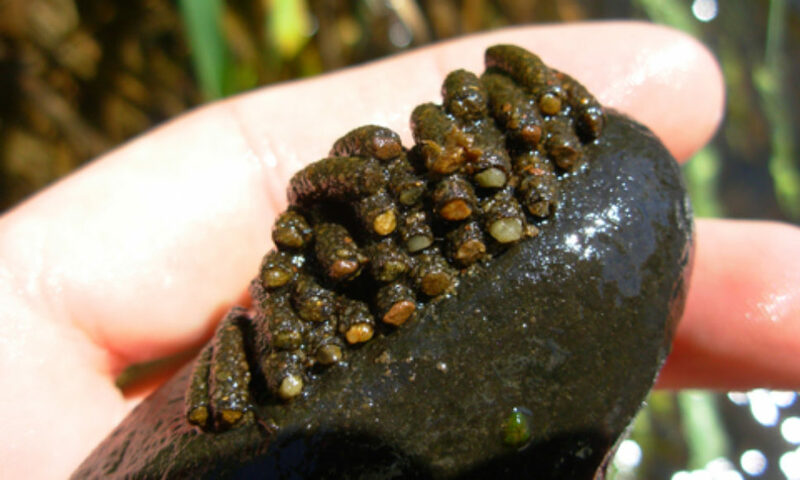 Mussels and some caddisfly larvae filter small particles from water. Other macroinvertebrates are predators, such as hellgrammites and dragonfly larvae. Benthic macroinvertebrates are not only important components of the aquatic ecosystem – they are also indicators of water quality. Assessing a population of these creatures can tell us a lot about a stream’s overall health. Some macroinvertebrates, such as stonefly larvae and most mayfly larvae, can only live in extremely clean and undisturbed waters. Others, such as dragonfly larvae and scuds, are less sensitive to pollution and disturbance. Some, like midge larvae and leeches, can live in an array of water quality conditions and are relatively tolerant of pollution. 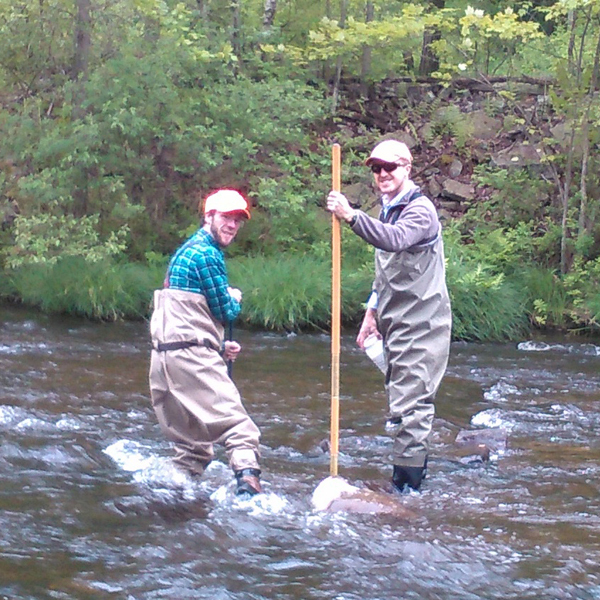 PCCD Watershed Specialist Matt Barr, left, conducts surface water monitoring with Nick Spinelli of Lake Wallenpaupack Watershed Management District. Collecting and identifying macroinvertebrates in a stream is one of the ways we learn about the health of a stream. Flowing water that has a diverse population with many pollution-intolerant organisms, such as stoneflies, is generally considered to be healthy, clean water. Fortunately, most streams in Pike County fit that description. A stream that has low species diversity and is full of pollution-tolerant organisms, such as midge larvae and leeches, is probably polluted. Such conditions are commonly found in highly urbanized environments. This spring the Pike County Conservation District will continue its surface water monitoring program which involves conducting macroinvertebrate surveys throughout the county. This is part of an on-going effort to understand water quality conditions in our streams. The Conservation District’s annual water quality report will be released in December 2018.